Well, that's it... last calendar challenge for this year. I hope you enjoyed making them. I sure loved visiting your blog every week. I used dry embossing on the big snowflake and heat embossing on the smaller ones; cobber, clear and glitter. I did emboss the big snowflake underneat too but I covered it with tissue paper and gesso, which shouldn't have been that white! 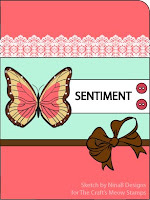 What a great idea to combine these 2 challenges - love the soft colors you used for December! Thanks so much for playing along with us at The Craft's Meow sketch challenge! 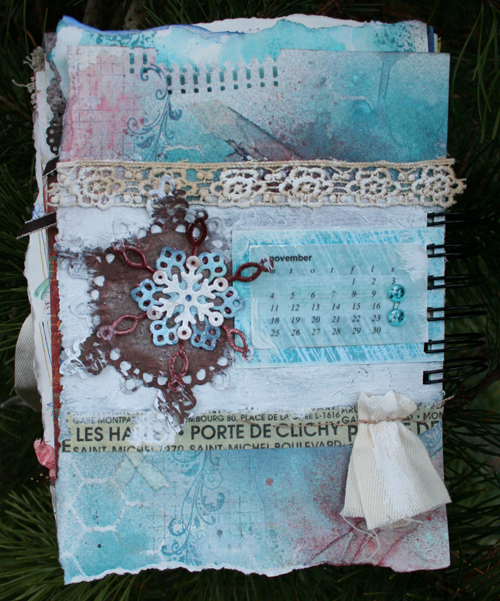 Great calendar page - love all the detail with the lace and snowflakes and the overall colour scheme!! This is a beautiful page, I love the torn paper and all the details. best wishes for Christmas and the New Year. Gorgeously inky calendar page with lots of wonderful details, including the fab embossing! Love the work with the sprays and the torn layers, beautiful last page ! There is so much details to look at. This is a wonderul take on the challenge! Lovely entry! So much to see here. I like the crispy colours and the torn pages. Glaedelig jul! Fabulously layered look to your calendar page. This really is a favourite of mine. I love your layered background, so many elements. Have a merry christmas. What a great take on this month's sketch challenge! Thanks for playing along with us at The Craft's Meow!